The old field where Jesse Owens once dusted his toes and Satchel Paige trotted the bases is about to get a facelift. 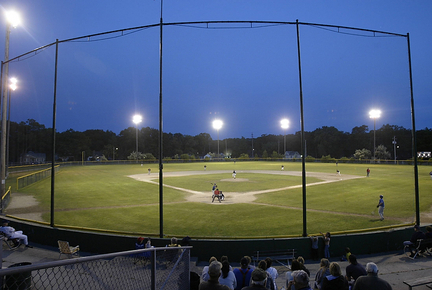 Marsh Field, on the corner of Peck and Laketon, has hosted professional baseball stars, an Olympic track champion and high school games for nearly 100 years. But, it’s starting to show its age. And officials from the cash-strapped city of Muskegon, which owns and cares for the field, think it might be time to forge a relationship for upkeep of the field with a private entity. Enter the Lakeshore Baseball Club LLC. The new organization, led by Pete Gawkowski and Len Piasecki, hopes to make improvements to the facility so that it can host local and out-of-town youth baseball activities from tournaments to summer camps. “Marsh Field has been in a state of decline over the past 10 years,” said Gawkowski, a West Michigan Subway sandwich shop franchise owner and developer of Extra Innings — a Norton Shores indoor baseball training facility. Marsh Field also has a walking path as part of the recreational facilities at the city park. A formal three-year agreement having the Lakeshore Baseball Club take over the operation and maintenance of Marsh Field is being put in final form by attorneys. The field would remain the home and practice field for the Muskegon High School Big Reds baseball team. Check out the ChannelCats on YouTube! The Muskegon ChannelCats are on YouTube! Check out these exciting photo slideshows of the 16U, 17U and 18U teams. Read more: Check out the ChannelCats on YouTube! Chris Sabo and Ian Engle are two ball players who aren't too happy the travel baseball season is almost over. They're not the only ones on the Muskegon ChannelCats 18-under team to feel that way. Sabo, Engle and company are starting to heat up, but only three games remain on their 2009 schedule after they swept a doubleheader from the Grand Rapids Elite Black on Monday. Engle turned in two all-around good games and Sabo picked up the win in both of Muskegon's 14-4 and 11-9 wins at Mona Shores High School. "It's great to pull out a couple of victories and finally get things going," said Engle, a Reeths-Puffer grad who plays at Jackson Community College. "It's huge to be making plays and getting the bats going at the same time." Travel baseball creates some challenges -- just ask Muskegon ChannelCats 17U manager Don Giddings. Indeed, all three ChannelCats teams are adjusting in the organization's first year back on the travel baseball circuit. The 18U squad is 5-7-1, Giddings' 17U team is 5-9 and the 16U club is 4-9. Co-coach Brandon Bard said pitching has been a concern for his 18U team. Two pitchers -- Spring Lake's Chris Sabo and Oakridge's Jamie Potts have experienced sore arms and haven't had a lot of time on the mound.